Just got back from quite possibly the most memorable fishing expedition ever with the good people at Game Fishing Asia (@gamefishing_asia).Admittedly, this post has nothing to do with fly fishing but I’d love to share this experience anyhow because it was by far the most challenging, most physically demanding and involved some of the most awesome-st top water strikes. 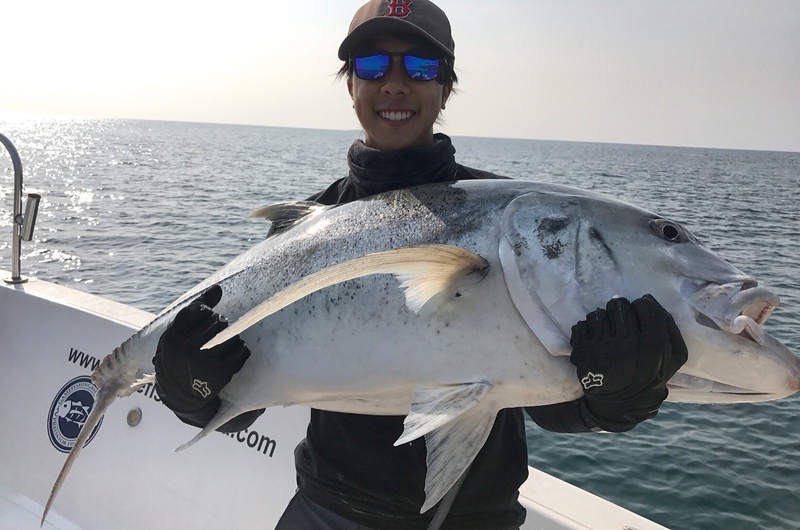 Having watched countless videos on YouTube about top water fishing for Giant Trevally, as well as being psycho-ed by my buddies Rainer (@rainerbee), Brian (@anglerbean) and top lad Mr Ray Ong, I decided to have a go at one of the most brutal, strongest fish – the GT. This trip had been planned and booked a year back in 2017. It was definitely the most anticipated trip of my life. Watching videos and following the adventures of the master Gt Buster Jones as well as the legends at MorningTideFishing and seeing how GTs annihilate a popper or stickbait, reading catch reports of how people were simply not up to the physical and mental demands of GT fishing as well as hearing stories of how brutal and savage these beasts hit you, I spent a good 3 months preparing myself for the trip. I worked out, practiced yoga, even headed to the local water to practice the chore of casting lures that are 130/140 grams on rods that were rated PE 8 – PE 10. I wanted needed to maximize my chances against these beasts. Joining us on the trip were 7 other Singaporeans and Malaysians who had tons of fishing experience and were very well equipped. One of whom is the maker of the famed Amberjack Lures. The first 2 days were uneventfully slow. With only 2 baby GTs landed and size-able Barracudas on our boat. The action well and truly kicked into gear once we headed to a different spot and once the moon phase and tides changed. Ray landing a BIGG Doggie on PE 0.6 jigging set up. The fight was for a good 10minutes and some of the runs the Dog Toothed Tuna made were nothing short of impressive. Brian putting up a helluva fight against the biggest GT he’s ever caught – a 36kg brute which man handled him like a rag doll. Safe to say that Brian met his match. Double trouble on Rainer’s lure as he yanked out a 15kg GT and a 20+ kg Grouper on the same lure! This made for some quite awesome pictures. A CRAZY GT frenzy right at the dying hour on the 2nd last day which saw more than 10 rats landed in a short span of 30 minutes. And of course, me coming in clutch on the last day, landing a 38kg, 129cm monster of a GT which showed me exactly what GT fishing is all about. I was fueled by pure adrenaline and after landing the fish, I crashed out for a good hour before I could start casting again. In all, it was an EPIC trip, averaging about 20 GTs (I could be wrong) each day across 6 days of non-stop casting, jigging, chugging poppers and working stick baits. Catch and Release! Fish for the Future!